Congratulations to Oliver in Pine Brook – NJ Pet Sitters Pet of the Month for November 2010! This little guy is a real trooper! 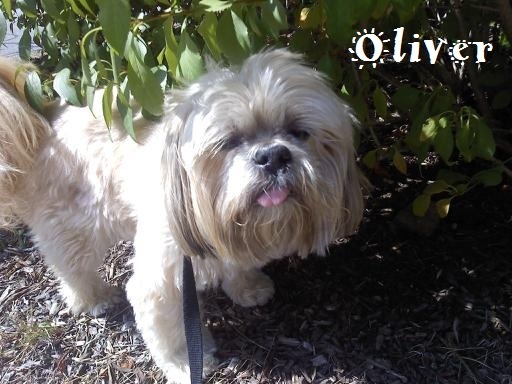 Oliver is 13 years old and has his bad days and his good days. I know he looks forward to his dog walk most of the time, because he barks by the balcony window sometimes when he sees me pull up. Most of the time he is sound asleep on the couch in his favorite spot. The past few weeks he has had some pretty bad days. He had tummy issues late one night and tried to go upstairs (hearing and sight failing) he hurt himself somehow and ended up bleeding from his front paw. His mom was so upset. A trip to the vet proved a nail had ripped from his pad/paw area and he had minor surgery to make it better. He is now sporting a blue bandage with smiley faces on it. The first day after the bandage he was carried spot to spot by his mom and myself to do his business. The next day he limped but wanted to walk around the block. Oliver is a great dog and I look forward to visiting him every day!